April is an excellent time to enjoy the warmer spring weather during both the day and evenings. Get moving on local trails, parks, and outdoor spaces. This is a cost-effective way to be physically active and enjoy the beautiful outdoors! Our bodies were designed to move. Do what’s natural. Get Moving Alabama! Take the first step to a healthier life by taking part in the American Heart Association’s National Walking Day. On the first Wednesday in April, we kick off a month-long celebration designed to help us all become more active. On the day of the event, participants are encouraged to lace up their sneakers and take 30 minutes out of their day to get up and walk. Download your toolkit! Join teachers, coaches, trainers, future professionals, exercise scientists, and recreation and dance educators, and students at the ASAHPERD Spring Conference in Orange Beach, Alabama. A great way to learn, network, and get moving outside at the beach! Walking is one of the easiest and most effective forms of exercise, but it can be hard to find time to enjoy it. That’s why we are inviting you to walk at your lunch during the 10th annual National Walk@Lunch Day on Wednesday, April 27. 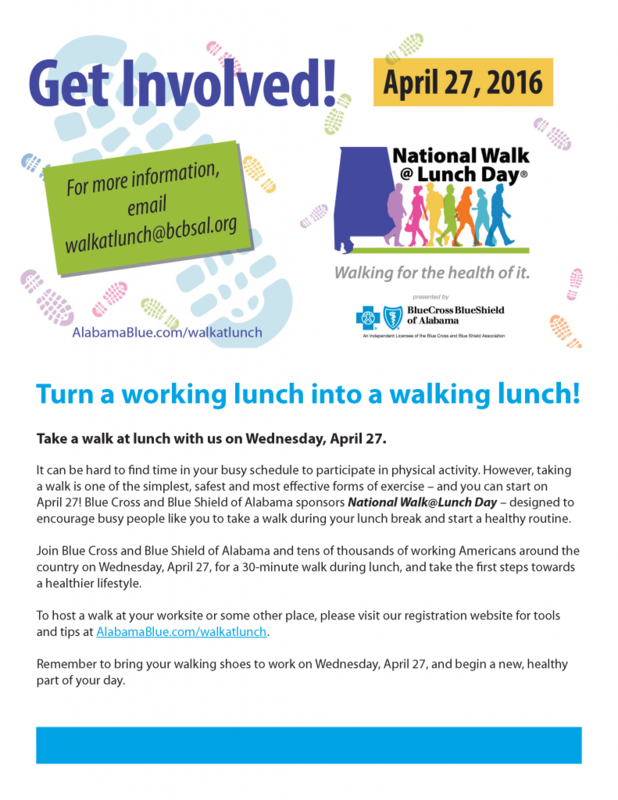 Make a pledge to walk for 30 minutes during your lunch hour. Get more information.